I heard rumors that a great burger place was opening up at "the point" of State and Archer... and I had to check it out. I thought to myself "finally a burger place on the South Side of Chicago." Unfortunately, after trying the food... I realized we still DON'T have a great burger place on the south side. Some of the menu items we tried were awful. In fact, they may be some of the all-time worst food decisions I have made. From bland to oily, the food was never that impressive. The ordering system seems like a great idea and somewhat "futuristic" but all I could observe was a congested counter with a longer line than necessary and an unused, confusing iPad system. Overall, this barely made it to a 2 mile rating. It was saved by a tasty chili and some decent wings. I probably won't be back unless the restaurant can convince me to give it another try. speed up the ordering process, but it didn't appear to help much. Singlehandedly could be one of the worst meals I have ever eaten. Whenever I see something unique to a menu, I tend to order that item; however, this time, this habit of mine backfired. 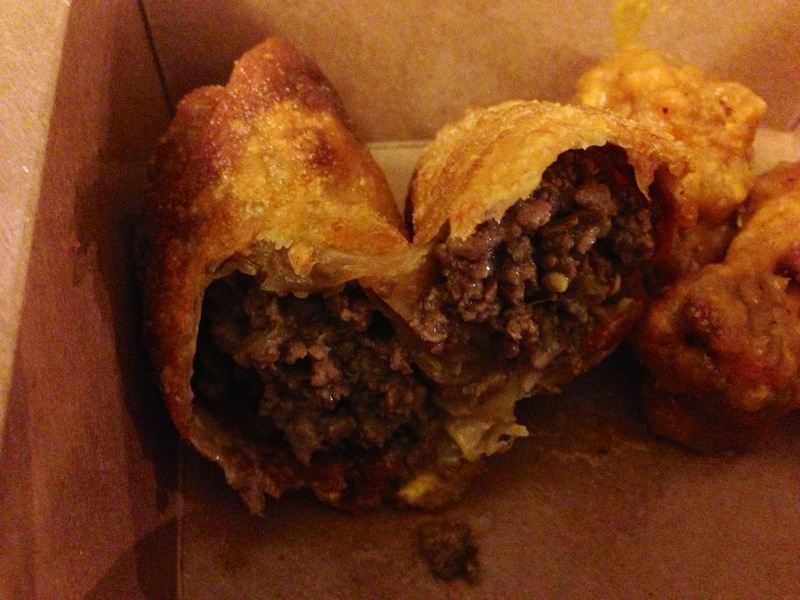 The burger egg rolls were exactly how described except they forgot to mention the gallons of oil that will also fill the egg roll. Inside the deep fried wrapper was ground beef and cheese and enough oil that it would run down your hands on each bite. It was awful. It is accompanied with their special sauce which is a mayo based sauce mixed with some ketchup and I believe relish. I would never order these again and it will be difficult ordering even an egg roll at a Chinese restaurant because of the fear of the amount of oil it may contain. The shroom burger was one of their creations topped with tons of mushrooms and both swiss and brie cheese. In addition, my friend had them add lettuce, tomato, onions, honey mustard, ketchup and pickles. The burger was good sized and in her case was a veggie patty. She also requested the bun be changed from the typical brioche bun to a pretzel roll... which was a great decision. The brie cheese was a thick slice and when melted just ran right off the burger. I assume that the burgers here are better than I currently believe... but I will have to come back and try one first. When biting into my first chicken wing, I was glad I added this to my meal. These were 100x better than the burger rolls I chose. The order came with six huge wings, which were quickly fried, giving them a nice crunchy texture and extremely hot and moist inside. The were tossed generously in a habanero mustard sauce that I chose. The sauce was SPICY. It started off more mustardy, but as you ate wing after wing, the heat definitely creeps up on you until you are looking for that glass of ice water. If you like spicy, I highly recommend the habanero mustard... but I will make the assumption that the other sauces are good too. The wings... something worth trying at this burger joint. The other positive part of this meal was their chili. Made from scratch each day, the chili is a good mix of spices, meat, beans, and an array of toppings. I went ahead and got my loaded with all of them, including olives, chopped jalapeños, chopped onions, sour cream, and cheddar cheese. It was extremely hot (temperature-wise) and had a nice spiciness with the addition of the jalapeños. I should have stuck with my gut instinct and ordered the burger covered in chili... maybe next time if there is a next time. When something is considered a speciality... you would think it would be amazing and something that would draw crowds to the place. Well, I saw many websites praising the spiral potato stick at The Burger Point... but after receiving our spiral potato stick, I was left with not only disappointment with this recommendation, but also a bad side dish. We chose the salt and vinegar spiral because of how tasty salt and vinegar chips tend to be. There was nearly no seasoning on this spiral except for some white powder that covered the one end of the spiral and maybe two chips deep. Everything else was a bland potato chip that ketchup couldn't even help. I do not recommend this at all. Finally, a side dish that actually had flavor and was worth ordering. The sweet potato fries were dusted with sea salt, but a cinnamon sugar variety was also available. They did serve the fries with some awful cilantro pineapple style sauce... it didn't taste good at all and we didn't use it more than one time. A little ketchup is all you need for these. - Some logistics: You can order using their iPad systems or you can order with the cashier. Sometimes the iPad system is faster, but I wasn't sure when you pay. - Order take out... they say it takes about 15 minutes to get ready, but in reality, it takes a little longer than expected and there is only one person running phones and cash register so the line starts to back up if multiple people arrive at once. - Stay away from the spiral potato sticks and the burger rolls. You will be thankful to never order them.